For the love of chocolate WHY did I read this? Oh right I really liked book 2 and thought Paige hired an editor or magically became a better writer. But I digress. 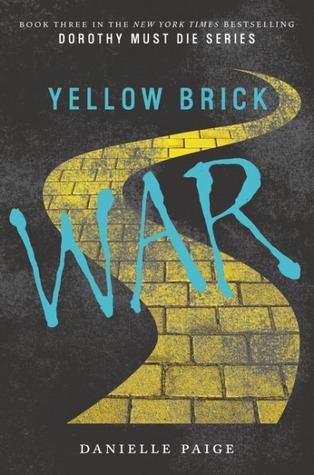 The Yellow Brick War starts moments after the jaw dropping conclusion of book 2, with an equally jaw dropping revelations. Only to then fall flat the rest of the book and leave me angry that this series is being dragged out into yet another book. Hasn’t Paige made enough money off of this series. Again, I digress. I’m trying to come up with a eloquent way to say this sucked but I can’t. There are soooooo many problems with this book, with plot holes and constantly repeating the same stuff over and over again, to not freaken ending the series. I don’t see myself reading book 4 but I might be convinced otherwise the way I was with book 2. Who knows? Right now I am disappointed I wasted my time with this. This entry was posted in Fantasy, Magic, Witches, Young Adult and tagged Danielle Paige, Dorothy Must Die Book 3, magic, Yellow Brick War, Young Adult. Bookmark the permalink.